All the news from Los Angeles is about Kobe Bryant these days (at least, the news that isn't related to SC dropping a game at home to the Stanford Cardinal), and with the Sonics playing the Lakers tomorrow night in Bakersfield, could this be the last time Kobe suits up in a Laker jersey against the Sonics? (This is, of course, assuming he makes the trip). Why do I care? Well, because Kobe is one of a select group of players who are almost universally hated in the NBA. With the exception of those twits who live in the 206 and own a Kobe-8 jersey, most folks around these parts would sooner wax their unmentionables before donning a Laker jersey, let alone a Kobe one. I'll take arguments on the other 9, but no opposing player in the history of the Seattle professional basketball ever received as many boos as Karl Malone. Sorry, but that one is in concrete. Man, all those Suns: Majerle, Rex Chapman, Frankie Johnson (or, as I called him, Frankie "Bad" Johnson). 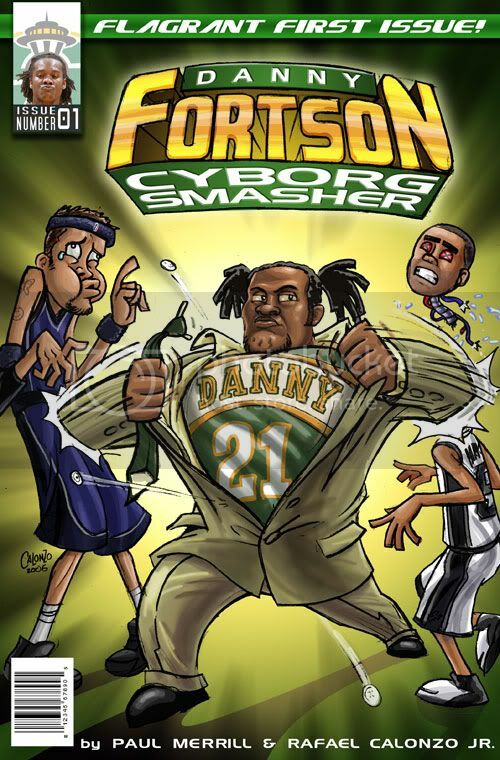 Man, I'm embarrassed to say I forgot about Thunder Dan. He really should be top five on any list such as this ... I should be forced to turn in my Nate McMillan jersey for that blunder. I nominate Ruben Patterson for the top ten. We loved while he was here, but when he left for the Blazers it was whole other story. Oh, yeah, and he sexually assaulted his nanny. In the modern era, I'd have to add Brad Miller, Doug Christie, and the entire Spurs roster. In the 90's boom era, I really hated Nick Van Exel and Dennis Rodman. Man, I've got a lot of hate. Taking your Spurs' thought, Paul, I'll nominate Tony Parker and Manu Ginobili, especially Ginobili. That guy just sticks in my craw. And my craw don't like it when things are stuck in it. I nominate Bruce "Kick Ray Allen in the back" Bowen, he's easily my most hated sports star ever. And MJ just for killing our one shot in the past couple decades at winning a championship. It's ok, Paul. Hating Doug Christie is a must. I'll add Benoit Benjamin and since he was a former player, Wally Walker makes it on a technicality. Others: Vin Baker, Joe Forte, Danny Ainge, Zach Randolph, JR Rider, Bill Walton (although mostly for his commentating). What? No Bill Laimbeer? I think I was at the game where he clotheslined (or was it headlocked?) Reggie King. (I know, "Who?") '85 or '86 I think. Anyway, whatever or whoever it was, Laimbeer was an extremely dirty player and nearly universally hated. He must make the list. Seriously, Rex Chapman and Manu Ginobli both have to make a top-10 list, along with Bruce Bowen. Don't forget Jeff Hornacek. That creepy touching his face thing he did at the foul line bugged the tar out of me. (Yeah, I know it was some sort of recognition thing for his kids, but it still bugged me). Gonna have to second Ginobli and Chapman. As much as a douche as Laimbeer was, we only saw him a couple of times a year at most here in the Northwest, so he wasn't really on our radar (or mine, anyway). I forgot to mention Shaq. I really hated him when he was with the Lakers. Nothing personal, just hated that the Lakers bought themselves an insta-dynasty like the Yankees. Gawd how I hate the Lakers. The only thing I hate more is Kobe fans who go to Sonics games and cheer against Seattle. OH, THE HATE I HAVE! I thought about Mutombo and Shaq, but I never felt like they got hated as much as the other guys. I'll freely admit I screwed up by not including Thunder Dan and Ginobili, but to me, Shaq was always too good natured to be hated, and his pinnacle of success in LA coincided with a real down-time for Sonic basketball. It's hard to hate someone when you're irrelevant. Well, except for the Blazers. It's always easy to hate the Blazers. And good for your colon, as well. 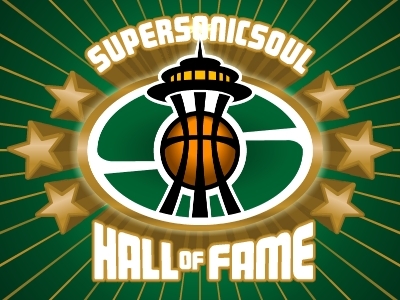 Eddie Jones used to murders the Sonics, but I'll have to agree with the Doug Christie voters. Not only is he from Seattle, his wife is his stalker and she is not attractive, and on top of it, he always throw up that I love you sign all game. AND he had the worst hairline in the NBA when he was playing. Man... that feels good to get that off my chest.